Known as a melting pot of cultures, exotic Singapore offers a unique thrill for holidaymakers in search of novel experiences. Local residents too may find that the numerous holidays and festivals in Singapore add a splash of colour to their week. Whether you’re keen on experiencing all that the city has to offer, or simply looking to spend an enjoyable day out with a friend, our sunny island has something for everyone. The following events and festivals are some of the most widely celebrated and highly anticipated ones of the first half of the year. With New Year’s Day being a public holiday, you don’t have to worry about falling asleep at work even if you join in the all-night celebrations taking place across the island. Head to the popular Esplanade or Marina Bay areas to enjoy countdown performances, or to the beautiful Siloso beach at Sentosa for wild foam parties. If you’re dining out on 31 December, make sure that you’ve made your reservations months in advance, as throngs of revellers will be lined up to participate in the countdown. A glorious display of fireworks will be visible from many parts of Singapore. If you’re feeling a little disconsolate once the party ends, however, cheer up because a second holiday is right around the corner. 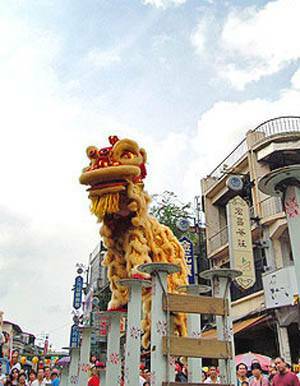 The most widely-celebrated festival among the local Chinese population, the Chinese New Year, which falls on the first day of the lunar calendar, generally takes place in late January or early February. It goes without saying that Chinatown in particular is a hub of frenetic energy and excitement in the days leading up to this 15-day holiday, as shops go all out in decorating their shops with auspicious red and golden paraphernalia. The beating of drums and cymbals heard from afar heralds the visit of a lion dance troupe engaged to usher in prosperity in the New Year. Visit the local markets and nurseries to soak in the exuberant holiday atmosphere. Tip: Note that many shops and hawker stores will be closed on Chinese New Year’s eve as well as the following three days, as employees return home to spend time with their families. The annual Chingay Parade takes place around this time as well. Chingay (Zhuangyi) is a celebration of the art of costume and masquerade, and the parade showcases a fascinating procession of extravagant floats and performers from 150 organisations, including traditional Chinese dancers, daredevil stilt-walkers and martial artistes. In recent years, the parade has become a multi-racial celebration with the participation of the Malay and Indian communities, and is worth attending for the visual spectacles and fascinating cultural insights offered. On the day of the first full moon in the Tamil month of Thai, the Thaipusam festival is celebrated by Hindu worshippers. It generally takes place between mid-January and mid-February each year, and is a time of penance for past misdeeds. One of the most startling sights of this festival is the Kavadi Attam (‘Burden Dance’), an intense ceremonial practice held in worship of Lord Murugan, the Hindu God of War. Believing that their pleas for divine assistance will be heard through the bearing of a heavy ‘burden’, many devotees undertake great feats of physical endurance, and often pray and observe a partial fast for 48 days prior to the ritual. Devotees may choose to bear heavy weights, endure multiple piercings, walk on nails, and undergo flagellation. The best places to witness the procession would be at Little India, Sri Thendayuthapani Temple at Tank Road, or at the famous Sri Mariamman Temple—the oldest Hindu temple in Singapore. In the month of Vesãkha, on the day of the first full moon, devotees gather for the most important event in the Buddhist calendar. The festival usually takes place in the month of May. Also known as the ‘Buddha’s birthday’, Vesak Day commemorates the birth, death and enlightenment of the Buddha. On this day, joss stick offerings and flowers are brought to the temples, and the day is spent performing good deeds as the karmic goodwill generated by them is said to be multiplied on this auspicious day. It is common for believers to distribute free vegetarian meals to the poor, give blood donations, and release caged birds as part of the celebrations. At the oldest Buddhist temple in Singapore, Shuang Lin Monastery, Vesak Day celebrations include a Buddha Bathing Ceremony where visitors may witness the annual rites of purified water being ladled over the Buddha statue. The Dragon Boat Festival, held on the 5th day of the 5th lunar month, is a Chinese festival that honours the spirit of Qu Yuan, a poet and minister of the Chu state. The patriot, much beloved by his people, had drowned himself in the river, despairing of the imperial court’s corruption that led to the downfall of his state. Dragon boat races are said to have originated from that point, as the fishermen raced out in their boats to recover the poet’s body. Rice balls had also been thrown into the water to discourage the fishes from feeding on the corpse. Today’s rice dumplings, traditionally eaten during this festival, remain a popular food in Singapore, Taiwan, China, and in many Southeast Asian countries. Each luscious dumpling contains an assortment of ingredients such as dates, meat, chestnuts or salted eggs, encased in a glossy pyramid of glutinous rice, and wrapped in bamboo leaves. Competitive dragon boat races are still ongoing today, and those looking to get an eyeful of these intense races should make their way to the Marina Bay area to watch the annual DBS Regatta that takes place each May. In the second half of the year, the casual observer would find the taciturn residents of Singapore to be in a much cheerier mood. A reason for this could be the startling change in temperatures which dip by as much as 2 to 3 degrees, thereby encouraging island natives to emerge into the open to luxuriate in the cool weather. A much better reason, however, might be the numerous festivals and public holidays dotting everyone’s social calendars during this period. In the following sections, we will be explaining more about the events and festivals between July and December which hold the greatest import to locals. During Ramadan, the Muslim community in Singapore observes a period of prayer and fasting that lasts from sunup to sundown. Ramadan, the Islamic holy month of fasting, encourages self-discipline and abstinence from sin, and the Hari Raya Puasa festival marks the conclusion of this period. Just like the Chinese who celebrate the Lunar New Year, Muslim workers take time off from work to celebrate the festival with their family. Special foods such as ketupat (diamond-shaped rice dumplings) and rendang (caramelised spiced beef) are consumed, new baju kurong outfits are worn, small sums of money are given to children, and visits to extended family members are made. Bustling local bazaars can be found everywhere in Singapore, particularly in the East neighbourhoods. Visit the highly recognisable Sultan Mosque with its onion-shaped dome at Kampong Glam, or the street bazaars at Geylang Serai to sample delectable goodies, purchase an elegant Malay costume, and admire the traditional Persian carpets on offer. In the days leading up to 9 August, the island goes into overdrive as entire neighbourhoods are bedecked in eye-catching red and white to celebrate National Day. Patriotic jingles will be broadcasted over local channels as local artistes and songwriters collaborate on love songs dedicated to the little red dot. Having celebrated its Golden Jubilee in 2015, Singapore would be ringing in its 51st year in 2016 by hosting the celebrations at the beloved National Stadium—a first in the past 10 years. Highlights of the National Day Parade include daring aerial manoeuvers by the Singapore Air Force, processions of different military contingents, spectacular float displays, and music and dance performances, which all culminate in a grandiose display of fireworks. Parade tickets are distributed to citizens or Permanent Residents in Singapore. If you fall outside of this category, get a friend in Singapore to ballot for a ticket on your behalf in May and keep your fingers crossed! The Hungry Ghost Festival, while not being an actual festival to be celebrated with jubilant fanfare, is a hauntingly beautiful festival that touches many neighbourhoods all across Singapore. The seventh month of the lunar calendar, which usually falls in August, is dedicated to the realm of spirits and folklore. The dead are venerated with offerings that may include intricate papier-mâché mansions, luxury cars and even the latest iPhone models. It is believed that these offerings, when burnt, will be delivered to the intended recipient in the underworld. Late at night, it is not uncommon to see spark and flames licking at the edge of your vision as incense burners around the island are fed with bushels of offerings. Singing can also be heard as many neighbourhoods organise getai (lit. song stage) concerts that carry on late into the night to entertain the spirits, for whom the first row of seats is always left empty. When rows of colourful mooncakes line bakery shelves and lanterns are hung at shop fronts, you know that the Mid-Autumn Festival is just around the corner. The traditional brown mooncakes are just as popular today as they were when they first appeared in the Song Dynasty. Today, mooncakes are not just made with lotus paste filling, but also with new experimental flavours such as durian, raspberry or even Earl Grey. This harvest festival falls on the 15th day of the 8th lunar month, when the moon is said to be at its biggest and brightest. On this day, family reunions are common as people spend time with their loved ones, feasting on mooncakes and tea, while the younger members go on night walks, bearing colourful lanterns of all shapes and sizes. Annual celebrations are organised by cultural organisations such as the Singapore Chinese Chamber of Commerce and Industry where the visitor can enjoy word games, couplet writing, and stage performances. On the darkest night of the Hindu Kartika month, the community celebrates Deepavali—a festival that’s deeply imbued with spiritual meaning. The festival, which typically falls between late October and early November, is a celebration of the triumph of good over evil, light over darkness, and hope over despair. There’s no better time to visit the beautiful Hindu temples to admire the extraordinarily detailed statues, or to take a walk through Little India during this Festival of Lights, where the beautifully illuminated streets are filled with vibrant colours and the lingering scent of spices. Those who don’t wish to brave the crowd may also choose to participate in this festival by trying their hand at making rangoli art—a practice where coloured rice or sand is used to create elaborate patterns at one’s doorstep. Christmas is a time of great joy and celebration for all to indulge in the spirit of giving. The streets are gorgeously decked out in sparkling silver or gold, and decorated with every symbol of Yuletide that one can think of, from gingerbread houses to snowmen and Santa Claus. Celebrations of the birth of baby Jesus are carried out in Christian churches across the island. Members of the faith flock to Saint Andrew’s Cathedral, the largest and one of the most beautiful cathedrals in Singapore, to take part in the festive activities. Some notable light displays to keep an eye out for can be found along Orchard Road, inside Takashimaya Mall, and at Raffles City.